Those of us who are dyed-in-the-wool Theodore Dalrymple fans will welcome his latest book, Farewell Fear – a collection of essays more contemplative than his eye-witness, slice-of-life essays on the British lower class in his Life at the Bottom and other books. 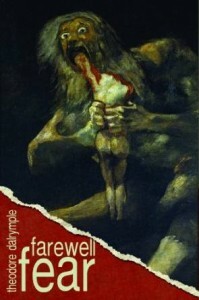 But there are nuggets of wry insights in Farewell Fear as well, and on a wider range of subjects, often devastating the conventional wisdom of our times. For example, he does not buy the idea that violent ideological movements are a result of the desperation of the poor. He points out, for example, that Cuba’s revolutionary movement was led by Fidel Castro, who “was both highly privileged, with a sense of entitlement and deeply resentful, always a dreadful combination.” That same could be said of Karl Marx, among others. Farewell Fear is a somewhat different kind of book by Theodore Dalrymple, but with the same thought-provoking insights. Once encountered, Theodore Dalrymple has become for many of us a shared treasure—the cultured, often mordantly funny social commentator who was for many years a psychiatrist at a British prison. This collection of recent essays captures Dalrymple at his best, ruminating at one moment about why poisoners tend to be more interesting than other kinds of murderers and at another why Tony Blair’s mind reminds him of an Escher drawing. No one else writes so engagingly and so candidly about the world as it is, not as the politically correct would have it be. Dr. Dalrymple’s eye alights on a topic–hedgehogs, insincerity, dictators; his mind dissects it; his imagination embroiders it; his judgment delivers an appropriate verdict, usually condemnation; and his sensibility ensures that all these activities are conceived, argued, and expressed wittily or sadly but always beautifully. This book is high intellectual meandering.